Everything you need to know about choosing a sperm bank to use for donor conception: questions you should ask. Comparison chart of 10 banks, including price and policy differences. 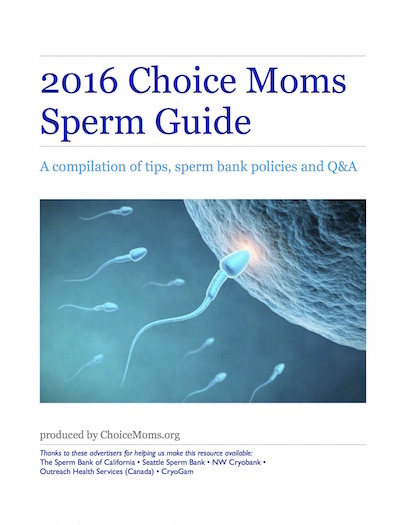 The Choice Mom Guide to Sperm includes everything you need to know about sperm and sperm banks but might be afraid (or not aware) to ask. PERK: a comparative chart of policies and prices at 10 sperm banks. Spotlights on two banks who support Choice Mom community resources. Questions addressed: how all sperm banks are NOT created alike (donor limits, open-identity, tracking, motility guarantees, refund policies).... questions to ask a bank before using.... how Choice Moms have chosen their donors... what if you want to make contact with half-siblings? Related resources.